The tools available to you will ultimately depend on the operating system you use on your phone and laptop. But for the sake of time, we’re going to focus on just one: Pushbullet. It’s free, has official Android and iOS apps, and pipes notifications into Chrome, Firefox, or Opera (so it can work anywhere that those web browsers are installed). All it lacks right now is the ability to mirror notifications from iOS, and that’s more to do with the nature of Apple’s mobile OS than Pushbullet itself. A Pro version is available for a few dollars a month that gives you more storage space and the ability to transfer bigger files, as well as a universal copy and paste feature that works between devices. Fortunately for the less technically savvy, setting up Pushbullet is a breeze. Sign up with a Google or Facebook account and you get access to an online interface where you can check up on your registered devices and even your push notification history. Next, download the official app for Android or iOS (or both). Once you’ve done that and logged in, you just need to add the relevant extension to your browser, and Pushbullet keeps everything in sync. For many apps, including Facebook Messenger and WhatsApp, you can reply straight from the pop-up notifications that appear in your browser. Alerts can be muted and dismissed from your desktop too. There’s plenty of other stuff to explore besides what we’re focusing on here. For example, you can push files and links between your various devices, as well as between contacts you add on Pushbullet. The app also lets you sign up for notification feeds (a bit like RSS feeds) on topics like the xkcd comic and Steam updates. If you don’t spend all of your time inside a browser, then there are desktop apps for Windows and Mac that you might have used before, although the latter is made by a third-party developer and will set you back $2.99. As we’ve mentioned, the mirrored notifications feature is currently only supported if you’re using an Android phone. Pushbullet’s Android app requires a couple of extra steps during setup, but the tool itself guides you through them, and then you’re ready to rock. Head to the Notification Mirroring page to configure which apps generate alerts on your desktop and which don’t. You can also disable mirroring for silent mobile notifications if you need to. When you see a notification appear on your laptop screen, you can dismiss it, click through to view it in Pushbullet, mute all notifications from the app, and, in some cases, even respond to it. These pop-up alerts are most useful as quick at-a-glance indicators as to whether you need to stop what you’re doing and unlock your phone or not. If you miss notifications you can review them in the Chrome extension or desktop app, and there are a few settings to fiddle around with:total alert counts, whether PushBullet runs in the background, how long notifications are shown on screen for, whether you get a sound with the pop-up, where on screen they appear and a handful of others. The iOS app is a far more limited affair because of the restrictions Apple currently puts on third-party apps accessing notifications, but you can still ping messages and files to and from your connected devices and see your Pushbullet history. Notification support for iOS had previously been available (via Bluetooth) but was pulled at some point. 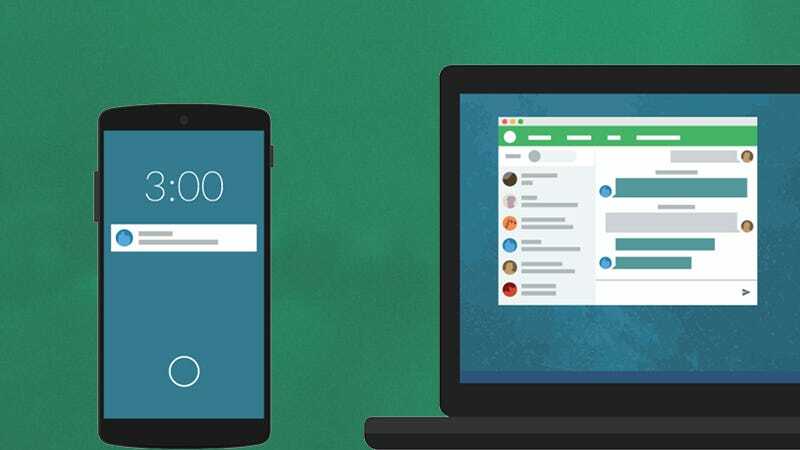 MightyText will show your phone notifications in Chrome in a similar way to Pushbullet, and it lets you send SMS messages straight from your browser too—but again it only works with Android devices at the moment. It has a few extra bells and whistles included, like photo and video sync, so it’s worth a look if your mobile runs Google’s OS. Of course iOS users who also use Macs can make use of the tight integration between the mobile and desktop platforms developed by Apple. A lot of the features we’ve talked about here happen automatically on hardware designed in Cupertino, provided you’re prepared to stick exclusively with Apple kit and nothing else. We’ve seen a few other third-party solutions floating around as well, like Desktop Notifications for Android, and Microsoft’s engineers have promised to add support for Android notifications to Windows 10 in the future—but we’re not holding our breath. For now, Pushbullit remains the only comprehensive cross-platform solution for getting push notifications on your laptop.